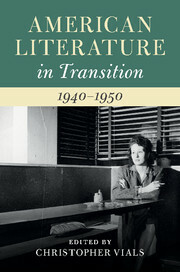 American Literature in Transition captures the dynamic energies transmitted across the twentieth and twenty-first century American literary landscapes. Revisionary and authoritative, American Literature in Transition offers a comprehensive new overview of the established literary landmarks that constitute American literary life. Ambitious in scope and depth, and accommodating new critical perspectives and approaches, this series captures the dynamic energies and ongoing change in 20th and 21st century American literature. These are decades of transition, but also periods of epochal upheaval. These decades - the Jazz Age, the Great Depression, the Cold War, the Sixties, 9/11 - are turning points of real significance. But in a tumultuous century, these terms can mask deeper structural changes. Each one of these books challenges in different ways the dominant approaches to a period of literature simply by shifting the focus from what happened to understanding how and why it happened. They elucidate the multifaceted interaction between the social and literary fields and capture that era's place in the incremental evolution of American literature until the present moment. Taken together, this series of books constitute a new kind of literary history in a century of intense cultural and literary creation, a century of liberation and also of immense destruction too. As revisionary projects grounded in pre-existing debates, American Literature in Transition offers unprecedented analysis of the American literary experience.